The following story is a fan-fiction character background for a game that I will soon be playing. The game will be played in the Forgotten Realms setting; a Dungeons and Dragons game and a product of Wizards of the Coast. There are usually two ways I write backgrounds. The first is in this form below, illustrating out how my characters life has gone. It is a way for my to understand the things that move them. The second form, is one I have used on this blog in the past. I use the character as a storyteller to relay a small part of their life to you. Again that also allows me to step into the head of that character. But both help me in different ways and on occasion I will do both. I had the idea for this character and her background for a while, but have only just tonight put it to paper. It came surprisingly fast for me, though I did have motivation. So this story is dedicated to Sarah, my unyielding task mistress and one of my girlfriends. *grins and winks* Hope you enjoy. Melisante Fatin el Zubaida is the second daughter born to Sayyid Hamil el Zubaida and Ziya Nur el Zubaidak. Sayyid Hamil el Zubaida resides as one of the Sultan within the country of Calimshan, and heads of one of the oldest noble families of the country. The families’ holdings control much of the spice and rare herb trade inside Calimshan and control a fleet of trading vessels that export those goods and others to the outside world. The families main base of power is centered primarily out of the great city of Calimport, and in that city of intrigue and danger, is where Melisante grew up. One could assume that the life of a noble is easy, and perhaps it is so when compared to the street trash or slaves. But the nobility have dangers in their lives as well. Those dangers are as life threatening, if not more so, then the ones that the low born endure. When Melisante was born she was “touched by the flame.” This was a gift that had not been seen within the family for a few generations. She had unnaturally red hair, red eyes (just the iris, not the whites), and a birth mark that appeared to be flames upon her forearm. Well aware that their bloodline had been mixed with the Firelord in their earliest days, the Sultan called for the priests of Kossuth to verify his daughter’s signs. The priests quickly confirmed that the baby was blessed by Kossuth and would grow-up to be something not quite normal. With that they offered the family a tutor, to appear when the child became five years of age. That person would help guide Melisante to the path she needed to follow. They explained that children blessed by the Gods directly had predestined futures, and that she should be allowed to pursue the path she wanted. Kossuth would guide her steps and the family should obey those whims. With those loose restraints, Melisante became quite wild. At the age of five she received her first tutor from the Temple of Kossuth and quickly ran through four others until one was able to rain her wild spirit in. Kalistin the Red Crone was an elderly priestess of Kossuth that had no patience for children. She had a firm hand and was allowed the freedom to use it. Melisante fought in those new restraints, but eventually succumb to the Crone and started to learn at last. Though as the girl grew up, it was apparent that she was becoming vain and believed she was superior to those around her. Melisante also showed some ability with divine magic and even at a young age was starting to grasp some orisons. But she was beginning to be unreasonable in all things and perhaps a bit delusional. At the age of eleven Melisante believing that the fire was at her control, stuck her hand into a religious pyre and kept it there through the pain; until she nearly lost it. That lesson shook her world and the grasp of her abilities. The Red Crone noticed each of these flaws. In the wake of the Melisante’s stupid attempt, she believed it would be best to remove the child from the family and country. A priest of Kossuth and more importantly a student in training to be a priest must be live a life without. Until she acquired a middling rank within the church she would never be allowed to own possessions of her own. Aside from what she was given, she would own nothing personal. She also would have to obey all her betters within the religion. Calimshan would not be a place inductive for her to learn such lessons. The power of her family, and position within the countries politics would never allow her to fully become accepting of her duties and the obligations that came with them. Melisante’s hand was forced to heal naturally, to teach her a lesson. When she was fully healed, the Red Crone brought her on a pilgrimage. The two of them went to their faith’s greatest temple, the Flaming Brazier within Thay, based out of the city of Bezantur. Thay had many of Calimshan ideals; strong magic, slavery, harsh leaders, and political undercurrents. But it was far more intense and had a much more dangerous Kossuth upbringing. Students and priests would live or die by their choices. The Red Crone believed Thay to be a perfect proving ground for the child and that the hardships she would endure there should make her that much stronger; if she lived. Those years were quite dark. One does not survive to the higher echelons within the religion of Kossuth if they are meek, weak, or kind hearted. All acolytes fight for places within their superiors eyes, and often there is blackmail or freak accidents when insults fly or jockeying for position gets blocked. The faith believes in burning away the weak, some students and teachers take that to heart. By the age of fifteen, Melisante had been poisoned, beaten, burned, stabbed, raped, and had been forced to endure many other degradation. But she had survived and had become stronger for it. Many whom had committed acts against her, even priests, had not lived long after. Because of this many began to fear her and believe that she was touched by their God. Such were the rumors that spread, with the help of Melisandre and the few close friends she had made. That year was also the first year she was deemed suitable to go out representing the temple. Her first mission was to provide healing support for the invasion of Aglarond. Melisante joined hundreds of others to work for the armies of Thay. The faithful worked always in groups and were a vital part in the support services. Melisante began to practice daily with her weapons, and watched many of the soldiers who did the same thing. She found a thrill in using them more and started to see the real reasons in why she needed to know how to wield larger weapons. Melisante soon found some teachers among the troops; most would claim it was their duty to disabuse her of the priests “wrong” fighting styles; so they all said. But she enjoyed their attentions and took what she could use from the lessons, which improved her combat immensely. Melisante worked in and out of Thay for years. She continuously proved herself and always returning from deadly missions made her stand out. Those people blocking the path of power she walked seemed to falter or die. After ten years of struggling to advance as a priest, she finally achieved a middling rank among the temples acolytes. With this new status, she was finally given the freedom all the lowest priests desired. Now she would be able to acquire her own wealth, power, and all of the things she desired in life. A life of poverty and complete acceptance to all her superior actions was over. 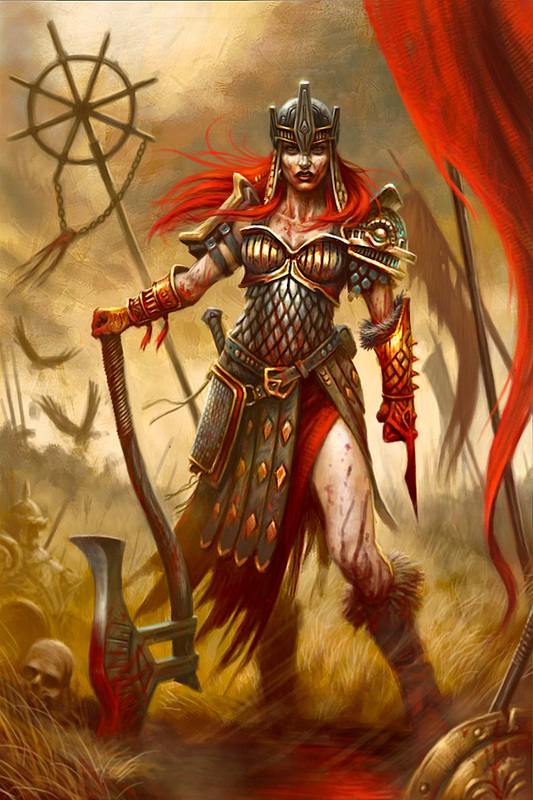 Not too long after achieving her new rank, Melisante and the Red Crone returned to Calimport. Her father and family soon swept her back into society, praising her return and her fast advancement among the faith. Melisante began to teach a few classes at the local temple and quickly embraced her new place within society. She was even courted, by the low and the powerful alike. A life of wealth and power was at her fingertips if she only was to take it. But soon she began to grow uneasy and untested. During that time, she began to have vivid dreams and daytime visions. Melisante saw a land of cold, with blizzards leaving travel nearly impossible and a cold that seemed to crack the very trees that lived there. It was a land without much and in desperate need of fire. But she knew that in a land such as this one, fire was life; especially within winter. She began to gather information about the churches reach within the lands of the north and found that it had nearly no temples in the far north; like the land of the silver marches. The land was rugged; overridden with orcs, giants, and dragons; there was little high society and political rankings. But the more she read about this backwater place, the stronger her dreams were and the more numerous. The people and places became so real to her. Melisante studied up on the people, the places, and the languages common within those areas. She plotted out the route she would take to get there; most likely leading her through the well-known city of Waterdeep, where her family had some businesses as well. But it would be easy for her to get to Waterdeep, and then she would have to find a way to travel northward. With this new adventure driving her and the knowledge that she was being led by Kossuth’s fiery hand, Melisante began to grow at easy again and started to feel determined more than anything. After months of plans and studying, she finally departed her home. The trade ship Flaming Sands, one of the ships from her family’s northern fleet took her north to her new life. This entry was posted in On Writing and tagged fantasy, Forgotten Realms, gaming, role playing, writing.